Instructions for setting up 1. Remove battery compartment. 2. Pull out the protective red tab you'll see behind the batteries. 3. Close the battery compartment. Press it firmly back to its place. Hold the dispenser over your palm. Slide the on/off switch to turn the dispenser on. 4. Place the dispenser on a bench top. Remove seal from Hand Wash Refill cap and insert it, cap-down, into the device. 5. Place hand under the nozzle and on top of the beam window until soap is dispensed. You may need to repeat this a few times for the first use. Pump twice. Wash hands normally. When the Hand Wash Refill is empty: Turn off the dispenser. Take the refill out. 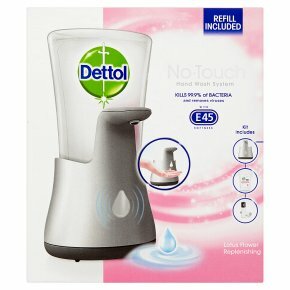 Replace only with Dettol No Touch Antibacterial Hand Wash Refill. Turn on. entation.<br>If the batteries are inserted correctly, the lights in front of dispenser should flash for a few seconds and stop when it is switched on and ready for use.<br>2. If the dispenser does not dispense properly OR does not dispense any soap at all:<br>Ensure hand is placed between the nozzle and the indicator light (see diagram).<br>Switch the dispenser off. Clean as described in the section on "Maintaining your Dispenser".<br>If soap is dispensing unintentionally, see "Maintaining your Dispenser".